It’s not easy being a USL coach for an MLS2 team. The tactics are sent down from the big club. The roster, too, is hardly your own and comprised of green teenagers, aspiring draft picks, and division two veterans. The goal is to win games, sure, but also to develop prized young players into MLS starters. Oh, and every now and then, your MLS parent club sends down players to rehabilitate from injury, expecting you to throw them into your lineup right quick. 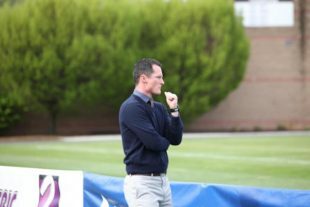 In just the second year of Bethlehem Steel FC’s existence, head coach Brendan Burke piloted the club to a playoff berth facing all those obstacles and earned PSP’s Coach of the Year award. While Burke played a whopping 41 players for the Steel in 2017, he forged a solid core willing to play collective and intelligent soccer together. Santi Moar starred often, but captain James Chambes, Aaron Jones, Auston Trusty, Chris Nanco, Hugh Roberts, and Seku Conneh were all part of a reliable first team who Burke trusted within the Union’s 4-2-3-1 system. With the arrival of Union aspirants Derrick Jones and Adam Najem, Burke seamlessly integrated the central midfielders into the lineup with little friction. Burke’s best coaching move, however, was getting both Cory Burke and Seku Conneh onto the field at the same time. Cory Burke is a traditional hold-up No. 9 in the mold of Union first-teamer C.J. Sapong, while Conneh can create his own shot in space. The manager brilliantly put Cory Burke in the No. 10 central attacking midfield role (hardly his natural position), to draw defenders and give Conneh space higher up the pitch. The result was a record-setting 10 goals for Conneh and another 9 for Cory Burke. As the Bethlehem Steel roster inevitably shifts again thanks to the movement of the Union first team, Burke has another year of experience at the helm to continue to improve results on the field and develop the franchise’s young talent coming through the pipeline. What interests me the most is apparently Burke “had” to use the same 4-2-3-1 as Curtin, but I hear Burke was much more creative with it, and made it work more often. I would love to see an article exaiming the coaching strategies between the two when it came to game day tactical choices within the 4-2-3-1 framework we use. Agreed. I think moving C. Burke to the 10 was a really savvy and imaginative way to put his best lineup on the field, while theoretically still employing the 4-2-3-1. Certainly would be interesting to see what would happen if you put CJ in the 10 for the U and someone like Fafa up top.